No Need Battery, plug into Wall, start to work. Color: Red, Gray, Black（Random）. Date setting: Press "set", then press "1", press "1" again, choose the date you want, then press "set". - Call Back Function. Basic Wall Phone in Slate. 9' handset cord. Pigtail wall connector. Single-gong ringer. Paramount 1907 Wooden Wall Reproduction Phone. Classic felted handset cord. Elegantly Decorated Wooden Wall Phone. Die cast relief panels on cabinet. Antique brass die cast finishing. Model: AW1907. 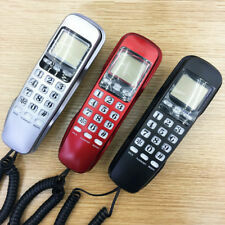 Hello Kitty Slim Line Corded Room Phone. Very good used condition. Excellent condition. Hang on wall or place on desk. Cords included. Dial tone and ringer tested. Instructions included. This is a corded phone and will work when the power is off. Great to have around. Circa 1930 modernized design. Stylish wall phone. Non-slip base. 5 year G¦úno hassleG¦Ñ warranty. International Policy. Bell South TP 201 Trimline Phone - Proper Working Order. Lighted Keypad Numbers. Corded Handset. 9' Handset Cord. Slide-Mount (Male Connector fits directly onto wall mount jack). Traditional Wall Phone. Wall Unit Base. SINGLE LINE. INTERNET PHONES, RETRO AUDIO, WEATHER STATIONS. Owner's Instruction Manual -SEE LINK. Nice wall phone. Made in USA. Includes wall plate. AT&T Trimline 205 Corded Phone White, new-in-box, Wall Mount No AC Power Needed. Condition is New in Box. Has last number redial, ringer volume control, and flash. Shipped with USPS Priority Mail. With a high quality of connection，can be mount everywhere. Color may be slightly different since different monitor. - Material: Plastic. 9 ft. handset cord. Fully modular. Single-gong ringer. Hearing aid compatible. Nationwide support system. Color - Ash. See all pictures. phone looks good but hand piece shows wear. You can place the base on a convenient surface or easily mount it on the wall, saving on counter space. A redial feature lets you quickly call the last outgoing number (up to 32 digits). Batteries: 1 Lithium ion batteries required. Wall Mount Corded Phone. Desktop / Wall Dual. If you have any problems, we are very glad to help you. Bright blue light call. We do not repair or replace item with expired warranty. There are no exceptions! It works well and the big button design makes it easy to see the numbers you're dialing. The extra features are a nice bonus for such a low price. Desk & Wall Mountable. Hold Button. Easy-To-Read Big Buttons. Classic felted handset cord. Elegantly Decorated Wooden Wall Phone. Die cast relief panels on cabinet. Antique brass die cast.